What Does an Art Museum Curatorial Technician Do? A curatorial technician works full or part-time in a museum taking care of the art collection and assisting the curatorial department in installing and de-installing exhibitions. They help out in many areas as needed, which may include identifying objects and recording data about them, and working with a variety of items such as skeletal parts, art, fossils, or textiles. Assisting with the care, maintenance, and security of art and objects in the museum’s permanent collection. Helping to develop and carry out educational and experiential programs for patrons. Taking care of any historical buildings which are part of the museum’s grounds. Identifying and recording data about the museum's artifact pieces. Assisting with working on inventory, plus packing, storing, cleaning, displaying, and safeguarding the art and objects of the collections. An art museum curatorial technician salary varies based on the level of experience, geographical location, and other factors. A curatorial technician job is an entry level position and only requires a high school education. Education: A curatorial technician job does not require a college degree. If an individual wishes to move to a more senior position in the museum, such as a standard curatorial position, this usually requires a college degree in art history or museum studies. There is room for advancement in this position, as many museums offer professional development and training for curatorial technicians. 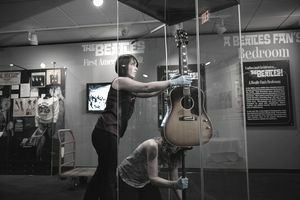 Training: Training for this position typically happens on the job, and curatorial technicians can learn a great deal if they have a chance to shadow a curator. Detail-orientation: Curatorial technicians may need to help take inventory and perform other tasks that involve a certain amount of important details, with little room for error. Fine art handling: It's important that candidates know or learn how to handle works of art carefully and appropriately. Physical strength and stamina: An individual must be able to lift and move heavy objects. Transportation: Having a valid driver’s license is often required. Museums have jobs available for curatorial technicians. According to the US Bureau of Labor and Statistics, overall employment of museum staff is projected to grow 11% from 2016 to 2026, which is slightly faster than the average for all occupations, which is 7%. The Bureau does not post specific statistics for art museum curatorial technician jobs, but the available jobs would be a very small portion of total museum jobs available. An art museum curatorial technician spends their time inside a museum, working out on the main floor or carrying out duties in the back rooms, away from the museum's visitors. Some museums offer full-time work, but other museums offer part-time work and require weekend, holiday, and evening availability to coincide with the museum’s curatorial exhibitions or special events. Get guidance by working with an experienced curator. You can find internships through online job search sites.